Inventory Accounting for Excel (Inventory Manager) allows to track and manage inventory quickly and easily in a single environment. Accounting of inventory items and parts is facilitated by relationships between inventory items whereby inventory can be categorized into groups so that the number of units in one item can change how others are updated. Multiple views for inventory reporting - by item, description, category, vendor, in/out, orders and projects. Support for multiple levels of bill of materials (BOM) with cascading hierarchy of inventory categories. Pivot table reporting with optional calculations such as outgoing balances, main price based on income amounts. Checks are made and notifications presented when related inventory levels should also be updated. 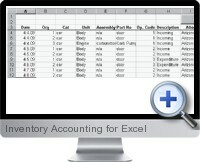 Inventory accounting levels allow reporting for different accounting purposes and methods.